Home » Posts tagged "U3"
Some people may think the distinction doesn’t matter and is just semantics, but in the June data, the official rate was 7 points lower than the more accurate U6 rate of 16.5% unemployed nationally. Using the U6 unemployment rate, which used to be the definition of official unemployment until 1994, we can see that we have the worst unemployment since the Great Depression (not since merely the 1980s as the media insisted for a while. Making sure people understand the severity of the situation is the difference between pressure for critical government efforts to save the economy and spur recovery and public pressure to reduce the deficit and debt in the middle of a gigantic recession. The latter has been the worrying trend recently. And once we get out of this mess, U6 versus U3 is the difference between helping Michigan and the Rust Belt states climb out of their semi-permanent hole that existed prior to the recession and continuing with business as usual. 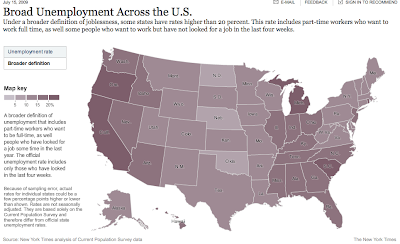 13% in Michigan looks much better than 22% unemployed. The post-recession part may be even more important, in terms of helping Americans in chronic localized recession. I once again commend the Times for looking into this, but the government is fundamentally misrepresenting the national economic situation to make things look better than they are, and that’s hamstringing the ability to implement good policy to fix things. The American media, as a whole, remains complicit in this fudge. I recognize that it would confuse everyone to have the national unemployment figure suddenly spike by changing it back to the pre-1994 way of measuring things (essentially what the U6 now measures), but millions of Americans are affected by this directly and indirectly; so it helps none of us to keep pretending things are much rosier than they are. In August, the official U3 unemployment rate was 9.7%, while the U6 rate was 16.8%. While studying an unemployment graphic by The New York Times back in March, I observed that they (like the rest of the traditional media) were ignoring the fact that the quoted national unemployment statistic (U3) is too limited in its definition. For example, it excludes all the people who’ve simply given up looking for work because there just aren’t any jobs in the area. This makes employment look far better than it really is, and it helps boost the stupid claims that western Europe’s national unemployment rates are far higher than ours. I showed that using the lesser-known U6 Bureau of Labor Statistics measurement of unemployment, which I explain fully in that post, US and Western Europe have very comparable unemployment most of the time. While I laud the Times for their graphic earlier this month, they and others need to begin incorporating the broader definition into their reporting both nationwide and state-by-state. This shouldn’t be swept under the rug had a technicality. The government won’t change the definition back, I’m sure, because it’s like rose-colored glasses for the state of the economy. But the U6 figure is out there every month, and it takes about 5 seconds more to locate on the BLS website. The media just doesn’t want to waste time explaining the distinction to people. Yesterday I reminded everyone to check the U6 unemployment, which gives a better picture of the unemployment situation in this country. There’s another reason I forgot to mention, other than that it doesn’t ignore the chronically unemployed. But the problem is, and I wish the old media would remember this, the official definition of unemployment changed in 1994, to exclude the chronically unemployed (who lack job opportunities in their area), which makes the situation look better. Not only does that mean that a slight decrease in unemployment does not automatically point to recovery (because people could just give up looking for a while and then be excluded), but it also means that the magnitude of the recession is ignored in media reports. Saying that this is the worst unemployment in only 26 years simply isn’t true. Using the U6 from 1994 to present and comparing that to the old official rate before 1994, which used roughly the same definition, we find that this is the highest unemployment since probably as far back as the Great Depression. This is probably the worst in 71 years. The Bureau of Labor Statistics shows me only back to 1948, but between 1948 and 1994, the highest unemployment was in 1982, when it reached 10.8% unemployment. Compared to the present (U6) unemployment, 16.4%, it’s evident that you have to go back past 1948 to find a higher unemployment rate than now. So I’m pretty sure that means going all the way back to the Great Depression, when (if I recall correctly) unemployment reached 25% at one point. After a brief recovery, it climbed back to 19% or so in 1938. But all that is obscured when the old media decides to ignore the 1994 definition change that artificially lowers the official unemployment rate by 7 points in the month of may. It’s the first Friday of the month, which means today’s labor report is out from the Bureau of Labor Statistics for last month. The U6 unemployment rate nationwide hit 16.4% for May 2009. This is much higher than the normally quoted U3 rate, of course, in case that seems high to you. But as I explained when the February data came out, we should be looking at the U6 to get an accurate understanding of the situation. I encourage you to read that post, if you didn’t before, since understanding the difference between the “official rate” and the U6 rate is critical, in my opinion, to understanding the US economy, especially when we’re not in a recession. I call the U6 “real” unemployment, just like people talk about “real” wage growth (which accounts for inflation).